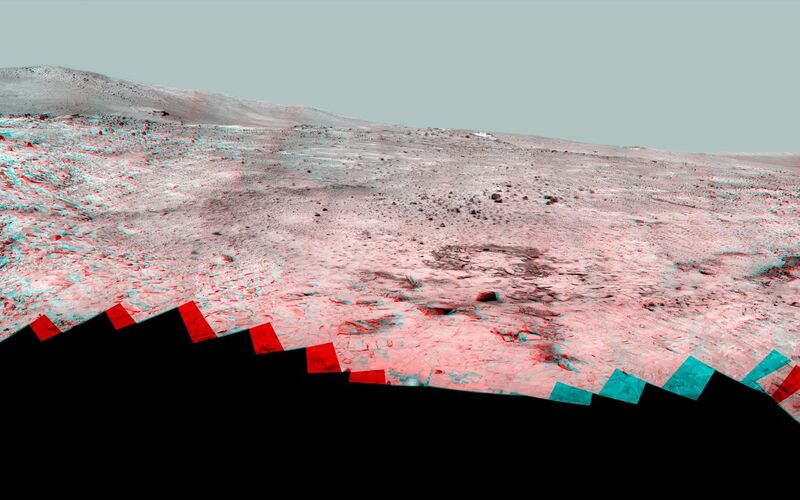 This 360-degree panorama shows the vista from the location where NASA's Mars Exploration Rover Spirit has spent its third Martian southern-hemisphere winter inside Mars' Gusev Crater. 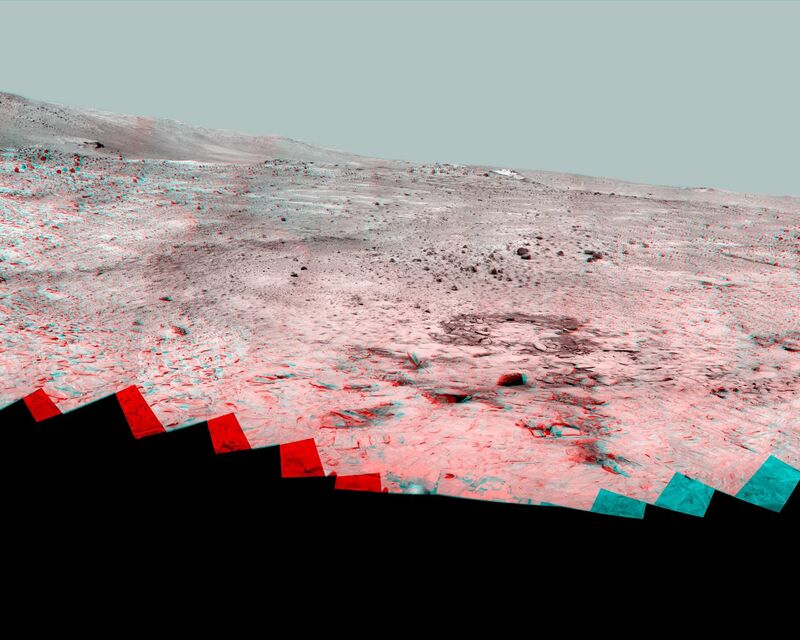 The view combines a stereo pair so that it appears three-dimensional when seen through red-blue glasses, with the red lens on the left. The rover's overwintering location is on the northern edge of a low plateau informally called "Home Plate," which is about 80 meters or 260 feet in diameter. The images combined into this panoramic view were taken by Spirit beginning on the mission's 1,477th Martian day, or sol, (February 28, 2008) and finishing on Sol 1691 (October 5, 2008). The hill on the horizon at far right is Husband Hill, to the north. Spirit acquired a 360-degree panorama (see PIA03610) from the summit of Husband Hill during August 2005). The hill dominating the left portion of the image is McCool Hill. Husband and McCool hills are two of the seven principal hills in the Columbia Hills range within Gusev Crater. Home Plate is in the inner basin of the range. The northwestern edge of Home Plate is visible in the right foreground. The blockier, more sharply shadowed texture there is layered sandstone whose layering is tilted inward toward the edge of the Home Plate platform. The northeastern edge of Home Plate is visible in the left foreground. Spirit first climbed onto Home Plate on that region, in early 2006. Rover tracks from driving by Spirit are visible on Home Plate in the center and right of the image. These were made during Spirit's second exploration on top of the plateau, which began when Spirit climbed onto the southern edge of Home Plate in September 2007. In the center foreground, the turret of tools at the end of Spirit's robotic arm appears in duplicate because the arm was repositioned between the days when the images making up that part of the mosaic were taken. On the horizon above the turret, to the south, is a small hill capped with a light-toned outcrop. 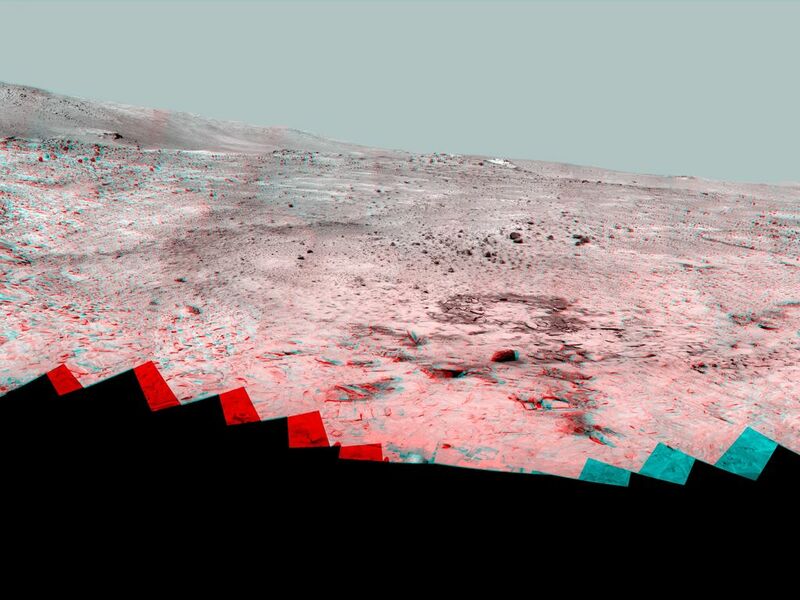 This hill is called "Von Braun," and it is a possible destination for Spirit during the upcoming Martian southern-hemisphere summer. The flat horizon in the right-hand portion of the panorama is the basaltic plain onto which Spirit landed on January 4, 2004 (Universal Time; January 3, 2004, Pacific Standard Time).